At the Contador press conference Bjarne Riis said, "When Alberto is not able to ... ride for the team, the contract cannot continue. I think that's pretty obvious," Riis said at a press conference in Madrid. Later, he added that he would be happy to work with again Contador in the future. 2 hours after the press conference, Riis announced he has signed a new rider to fill the Team Leader spot left by Contador. 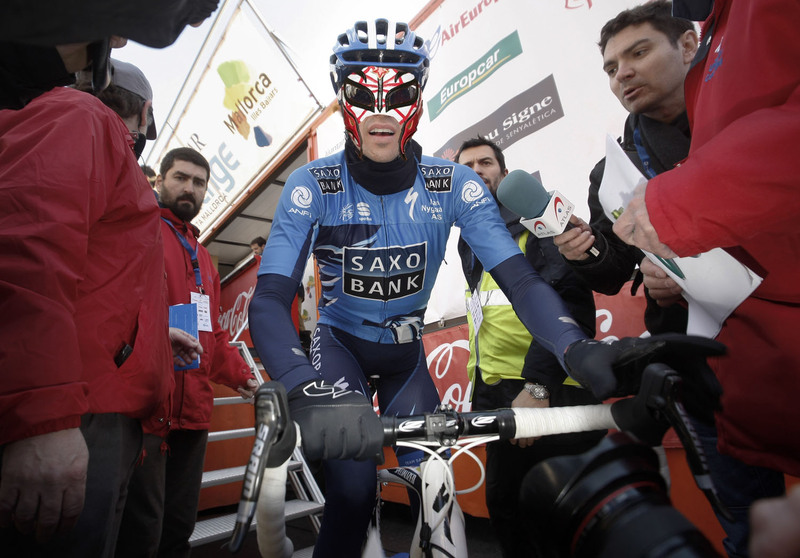 Riis said "The rider is known as El Magnifico Pistolero and hails from Spain....urrr I mean, Parts Unknown." He also added, "He wears a mask due to a sun allergy like the one that affects David Millar"
The soon to be named winner of the 2010 Tour de France (and Contador BFF) Andy Schleck was asked about Saxo Bank's new rider, he responded "He seems like a good guy, I like his mask. Perhaps, we can swim with dolphins together sometime to bond."